Well good evening!!!! Tonight I bring you one of those manicures, well, that I'm not quite sure how to name. It's pink, and it has some dotted tips....so pink dotted tips, I guess. I hate when my posts are boringly titled, I mean if I saw something called "Pink Dotted Tips" I would probably just turn away and not read. Maybe the pictures will drag in the readers or by the time I'm done writing this post I will come up with a better name. Most likely, I will remain content with the name, as it is the only way to explain them. Anyways, this is a manicure which I feel any pink lover would enjoy. I thoroughly enjoyed it, minus my ring finger, which you will see why and I will explain after. This manicure was copied after one I saw on Pinterest (Surprise, surprise) which was a Hello Kitty Manicure. Since I did not have any Hello Kitty stickers or stamps, I opted to not skip that part. 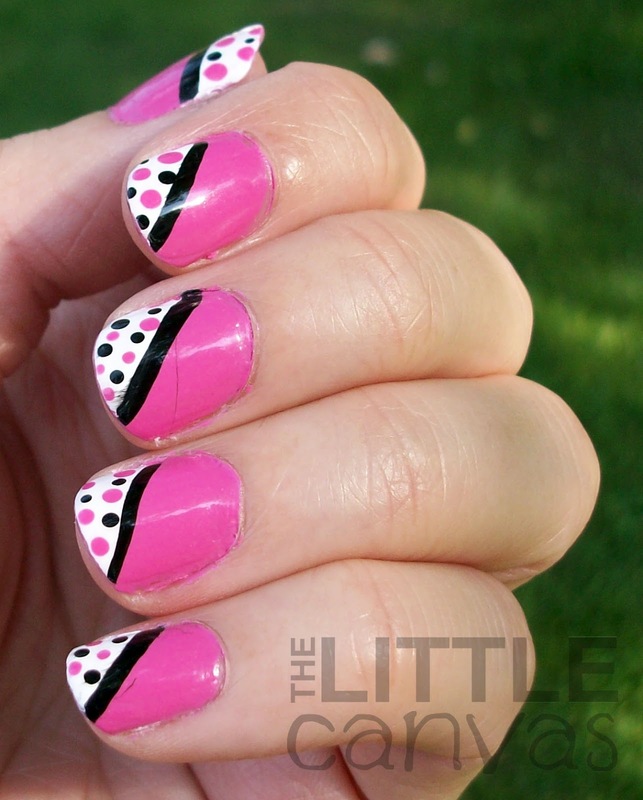 I wanted to link the Pinterest pin to this post, but of course when I went back to my nail idea board and clicked on it, it came back with a "No Pin Found." Bummer, because it was super cute with Hello Kitty, and the other girl's ring finger wasn't messed up. Easy peasy. I started by painting on a base coat of the pink polish. I have explained before how I have a love for Ulta Flamingo. Seriously, it is the prettiest pink polish ever, and applies like a dream. While this manicure could have been done with tape, I was running short on time so I decided to just free hand swipe the white tips with the Snow Me White brush. Once that was dried, I took my striper, dipped it in an old bottle of Black on Black and divided the white from the pink. 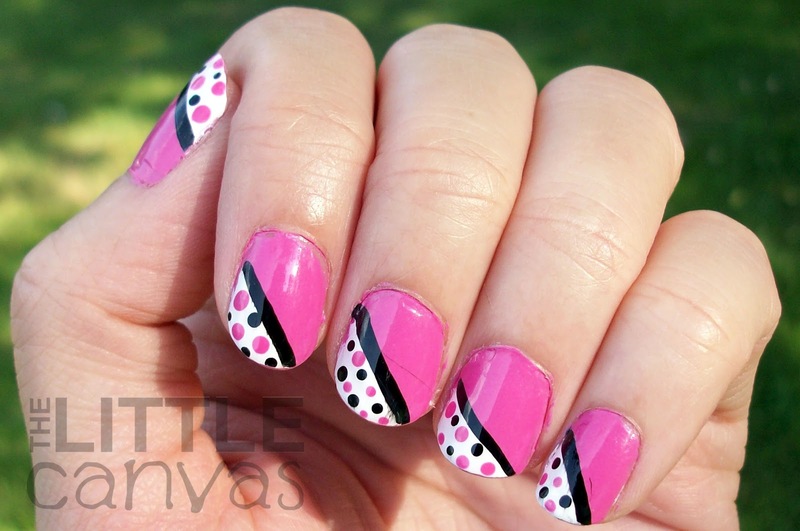 With my dotting tool, I added the pink and black dots. Smeared on some Out the Door, and went to sleep. Loved the color combination with this manicure. It reminded me of a comic almost, you know like the BAM cartoony things in the weird talky bubbles? You all probably think I'm crazy. Ring finger, why did I hate it you ask? Well, look at it! It is so uneven compared to the rest of the nails! My striper kind of striped it not so smoothly and it was not as thick, then the white wasn't really at the same angle as the other nails. Not to mention, when I first painted this nail, I slipped during the dotting (okay I sneezed) and I ended up with this huge black dot which I couldn't cover over with white polish. Therefore, that was my second attempt at that one nail. Usually when that happens, it doesn't turn out how I want it. What do you think? Love the color combo? Hate it? Do you see what I mean about those bubble BAM cartoon things or am I crazy? Would you only attempt this with tape? Have a better name for it? Well, I wrote this whole post and I have not come up with a unique name, so it shall forever remain "Pink Dotted Tips". Excuse me as I add the word "manicure" into the title so it doesn't sound so awful. you have to promise to show me when you do them! I didn't even know that CutePolish did this manicure!!!! I've never really gone through her vault, maybe I should. Is that bad? Lol I only look at her newest videos hahaha. Thanks for the link! I know right!? lol thank you! 31 Day Challenge - Day 5 - Blue Nails! 31 Day Challenge - Day 4 - Green Nails!